Proposed Revisions to the Definitions for the Early Childhood Workforce in the Standard Occupational Classification proposes changes to the titles, definitions, and placement for the detailed occupations involving the early childhood care and education workforce in the Standard Occupational Classification. acknowledges key limitations that cannot be addressed through proposing changes to the SOC categories and definitions, because of the nature of federal data collection on occupations, as well as the need for parallel steps to be taken to review definitions for the workforce working with school-age children in out-of-school-time care. 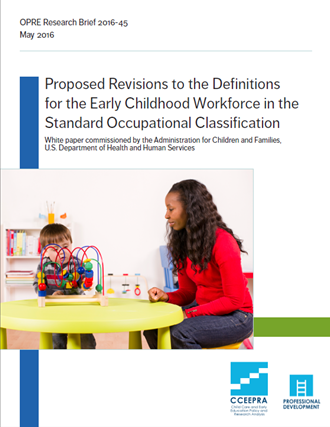 Proposed Revisions to the Definitions for the Early Childhood Workforce in the Standard Occupational Classification was commissioned by the Administration for Children and Families, U.S. Department of Health and Human Services and submitted by the Workgroup on the Early Childhood Workforce and Professional Development.